Since wolves have been taken off the Endangered Species List in Wyoming, they can now be hunted in many parts of the state … and they can also be trapped in areas where they're classified as predators. Rebecca Huntington reports that that's raising concerns that unintended animals could end up in the traps. REBECCA HUNTINGTON: Dave Pauli is an animal rescuer, who works for the Humane Society of the United States. 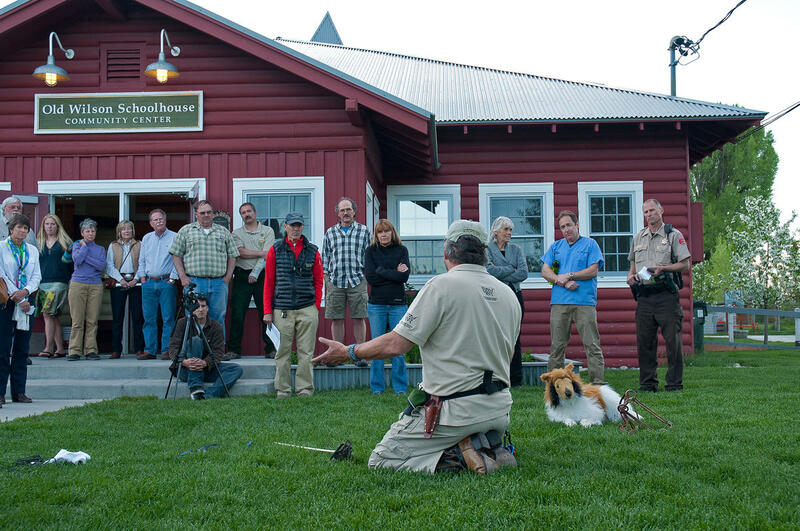 He's running a workshop at the Old Wilson Schoolhouse at the foot of Teton Pass, to teach dog owners how to keep their pets safe from wildlife traps. He stresses that wildlife traps can be found just about anywhere on public lands where wildlife is present. That's a lesson, Buffalo Valley resident Penny Maldonado, who is attending the workshop, learned the hard way. She was walking her three-year-old yellow lab along the Buffalo Fork River the day after Christmas. MALDONADO: And her teeth were gone. HUNTINGTON: Maldonado discovered a trap nearby that her dog had sprung and somehow escaped. She took her to the vet, who found metal ground into every tooth. Maldonado says the trap was for small animals, probably beaver or marten. But now in areas where wolves are classified as predators, Pauli says larger, more lethal traps could be set for wolves. PAULI: The severity of the trap, when you have large wolf-size traps, seven-and-a half, nine-inch jaw spreads, or you have 10-inch body-grip traps, those are unforgiving. HUNTINGTON: And Pauli worries that these larger traps could catch more unintended targets. PAULI: Devices that are going to catch wolverines and mountain lions, a lot of non-target animals. In Montana, they caught nine, non-target mountain lions in one trapping district. HUNTINGTON: Pauli's workshop is being put on by Wyoming Wolves Untrapped, a predator advocacy group that formed after Wyoming took over management of wolves. Although based in Wyoming, the group also worries about wolf trapping in other states, including Idaho where wolf trappers accidentally caught more than 200 non-target species in a single trapping season. HUNTINGTON: In Wyoming, numbers of how many non-target species are caught in traps set for wolves or for other wildlife are hard to come by. Reporting isn't generally required. But numbers are available from the federal Wildlife Services, which traps wolves and coyotes as well as other species in response to complaints of damage. Last year, Wildlife Services unintentionally caught two grizzly bears, mule deer, a golden eagle, a dozen bobcats and many other non-target species. The grizzlies were freed alive. HUNTINGTON: A veterinarian at the workshop says his clinic has treated dogs for "de-gloving," when a trap pulls a dog's skin off of its limbs. Pauli says there have been a handful of reported instances of unintended encounters in Teton County in the past year. PAULI: Question was asked how many dogs have been reported in this community, and it was four or five that were reported. I guarantee you it's four or five times that that were caught, but people just got them out and didn't do anything. HUNTINGTON: After demonstrating a variety of traps, Pauli takes people outside so they can practice releasing "Trapper," a stuffed animal that looks like a collie, that he borrowed from his daughter. HUNTINGTON: Pauli lists ways that dog owners can keep their pets safer … such as keeping them on leashes, and carrying a variety of first-aid supplies. HUNTINGTON: Sarah Hoffman plans to add items, from cable cutters to a strong leash, to her backpack. This is the first time she's worried about her dog, but not the first time she's worried about trapping. HOFFMAN: I worried about it for the wild animals. It really bothers me. It's always bothered me ever since I was a little kid. HUNTINGTON: She draws a line between trapping and hunting. HOFFMAN: My family has always hunted. I eat game meat. I'm supportive of hunting, I'm just not supportive of suffering. HUNTINGTON: What upsets Hoffman is that a wild animal might not die quickly and could suffer for days in a trap before the trap is ever checked. Trapping regulations in Wyoming vary depending on whether the wild animal is deemed a predator or trophy game. Pauli says the state's trapping rules could use an overhaul to make them more clear, consistent and humane. But he also defends trappers' intentions. PAULI: Most trappers are conscientious, and they don't want to catch a dog. HUNTINGTON: Still, Pauli says pet owners need to be mindful, especially in the parts of Wyoming where larger, more lethal traps are being set for wolves. For Wyoming Public Radio, I’m Rebecca Huntington.